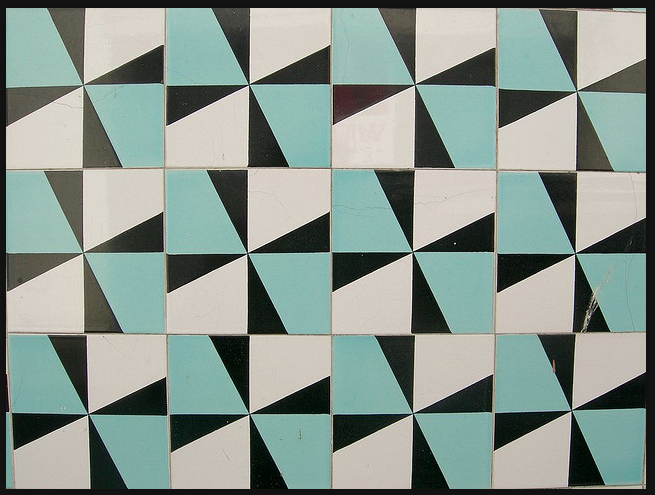 Posted on September 7, 2012 by Elizabeth E.
I started with this picture of some tiles from Portugal. 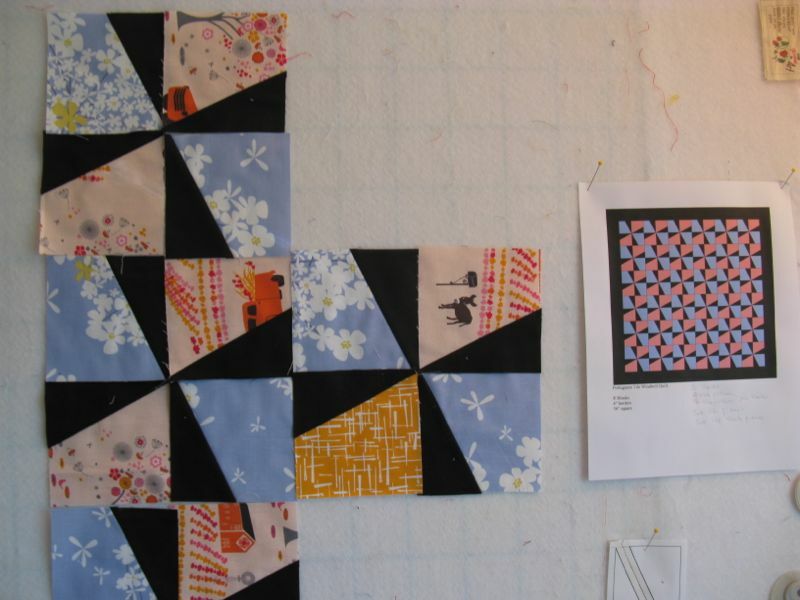 Then I mocked up a quilt in my Quilt-Pro 5 program. I mapped it out with 8″ squares, set 6 across in 6 rows, with a 4″ border, yielding a 56″ square quilt. 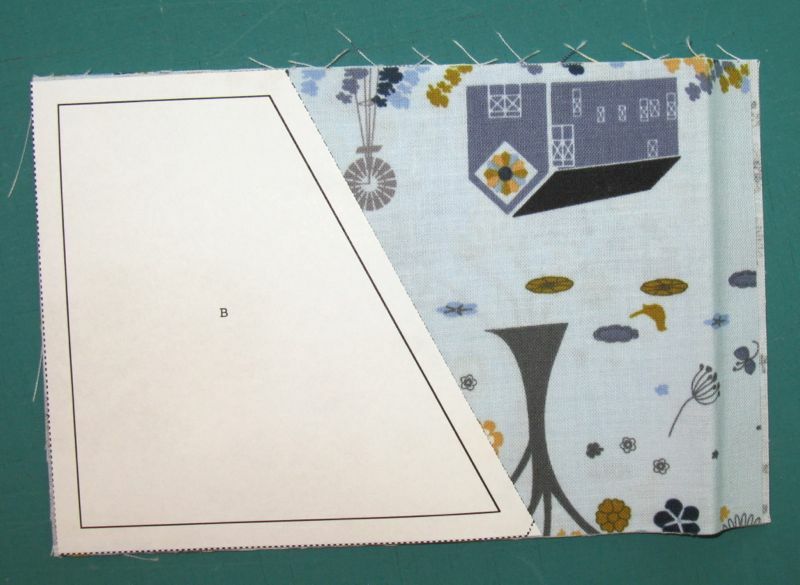 To cut out the large pieces, I laid out my fabric RIGHT SIDES UP, and cut a rectangle that was 7″ by 4 1/2″, then lay the template on the rectangle (see picture below), and sliced it into two. Here’s the template: PortugueseTileWindmilltemplateSM. I could have either cut all the black pieces according to a template, or figured out a way to make it easier. I went with the second. 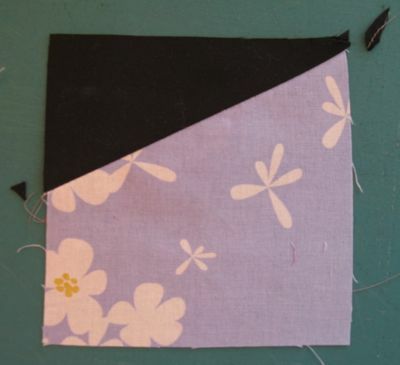 Cut a rectangle 5 3/8″ by 2 3/4″ and then slice it from corner-to-corner, diagonally. You will have dog ears you’ll have to cut off, if that’s a consideration for you. 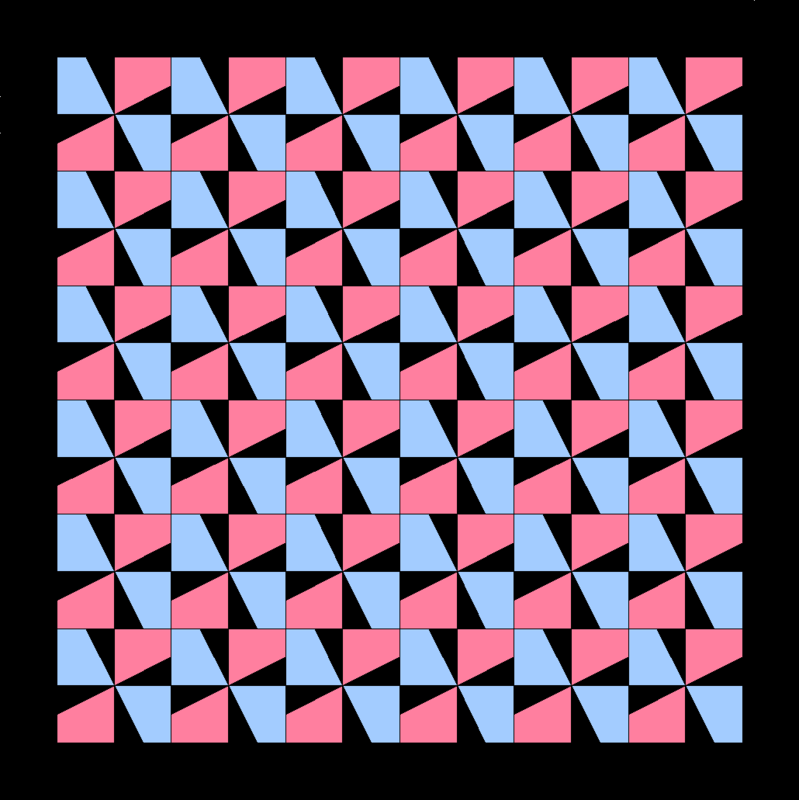 Cut 72 pieces of the blue line, 72 pieces of the pink/orange fabrics and 144 black triangles (that’s 72 rectangles, cut in two). 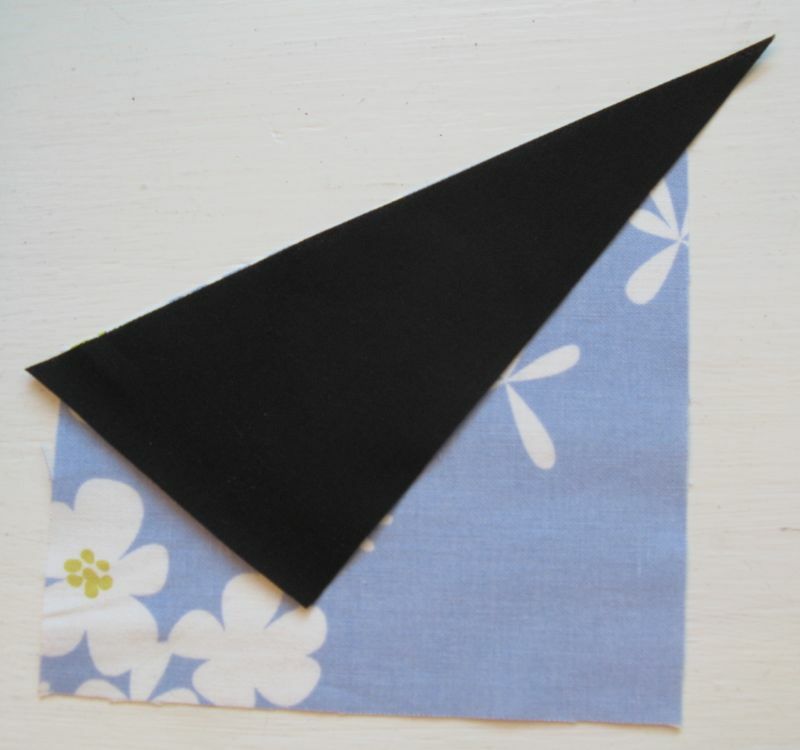 Lay a triangle across the larger piece. To get it lined up, put the black on top, with the left point sticking 1/4″ out over the edge. Don’t worry about that right-hand side longer point. Stitch. Press towards the black. 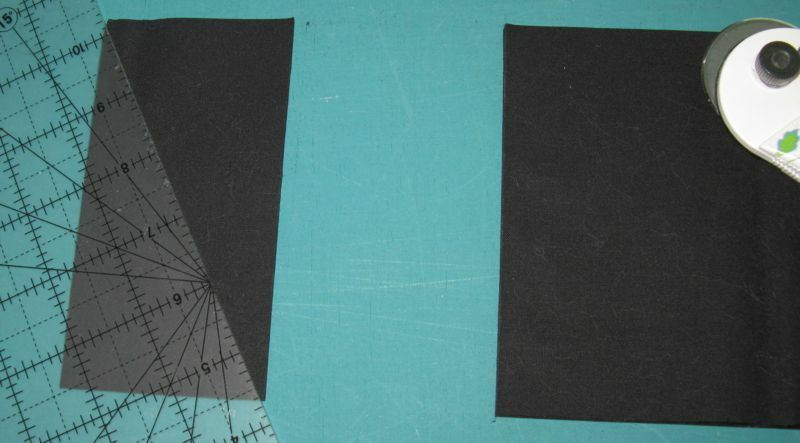 Now lop off those points, by truing this block up to 4 1/2″ square (see below). I’ve laid them out on my pin wall. 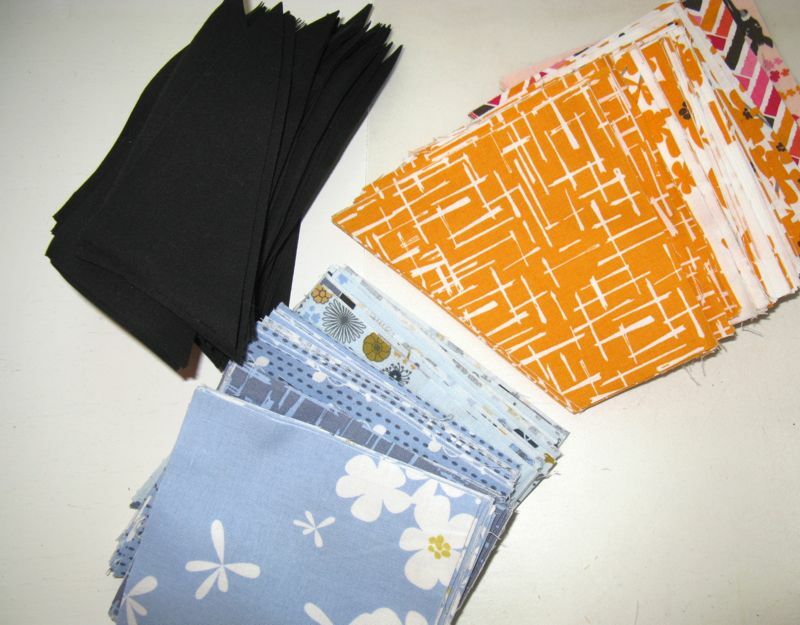 I don’t have enough of them to do the REAL work of laying them out, because I’m headed downstairs to make some corn-shrimp-coconut soup for dinner, but I’m thinking I do want to mix up the different types of fabric within the pink/orange group and the blue group. Thanks for you nice atta’ boy comments yesterday. I took to catch up on the speeches from the Democratic Convention (remember, I’d assigned the watching of these to my students, so feel like I need to keep up), and cut and sewed my cloth. It’s amazing the difference a day makes. I liked what Betty said, that this exhaustion must be in the zeitgeist or something. But after a break of a day, I may even feel like grading, knowing I have this little project to come back to throughout the day. You get up and moving early, don’t you? Those blocks are great. That was definitely one of the pictures from the slide show that stood out. It will make a great quilt. Love the geometric design. Thanks for the tips. Can’t wait to see it finished. That was my favorite in the tile slide show–thanks so much for blazing the trail! I’ll be making one soon!! 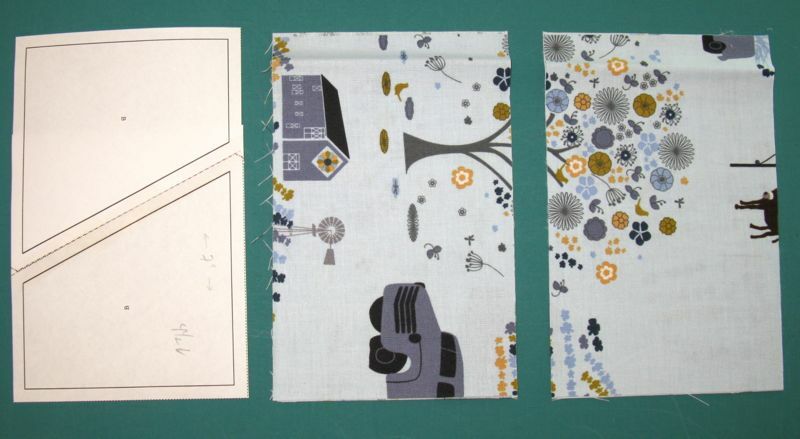 Love the block and I know I’ll be experimenting with some of my fabrics too. Thanks for the tutorial as well. Love your interpretation and I have my own stash of Madrona, but I’ve just decided to make this in solids. Cannot wait to figure out just which ones! 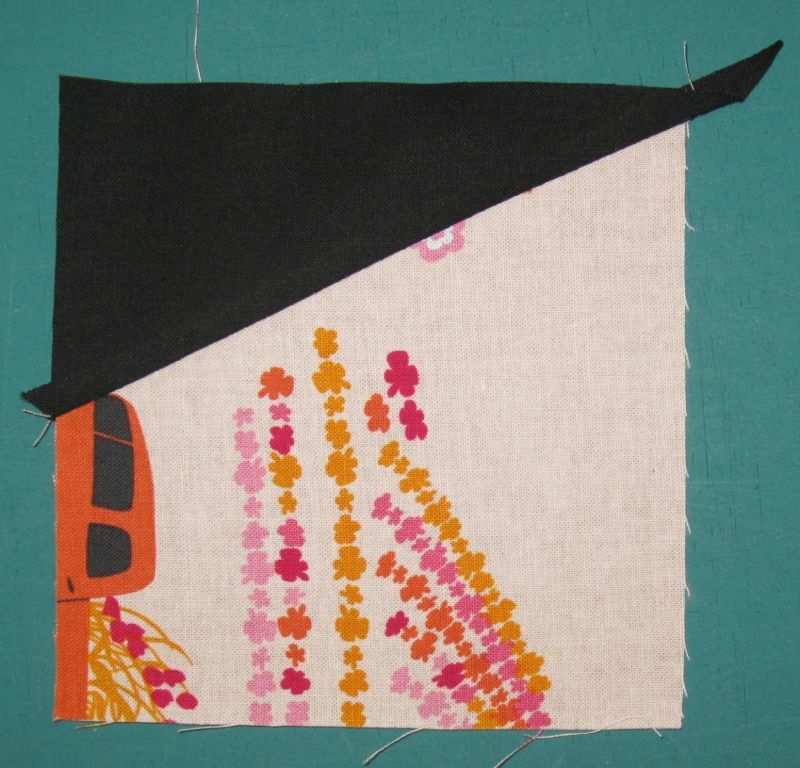 I am a new visitor to your blog, thanks to Selvage Blog, and will be following you because 1) There is so much to see that I just can’t wait to dig right in. 2) You are an English professor and I am a retired HS English teacher and my kid is a CC English teacher. 3) The writing is entertaining; the quilts are amazing. 4) I am from California and moved to NM 2 years ago, so I can get a little California fix.